I dusted off my copy of Paul Hollywood's 100 Great Breads a couple of weekends ago. I feel like I always say the same thing, but this book is so great! 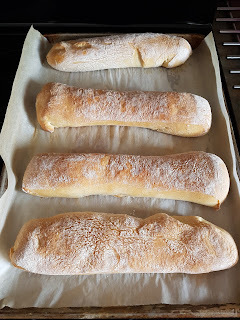 I wanted to make bread on a Sunday but I'd started late and didn't have a lot of time, so the Ciabatta bread was a perfect recipe to make to go with dinner that night - less than 2 hours of rising and baking time! It made 4 beautiful little loaves that not only went well with our stew, but also made delicious sandwiches. The recipe on the Paul Hollywood website differs slightly than the book; longer rising times, less yeast, but I am sure both will make delicious bread. 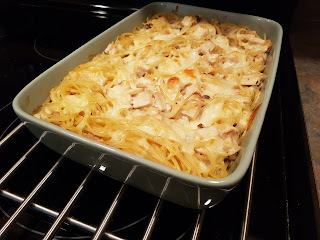 I won't make all of the recipes in the book but there are so many more I want to try. And I found a list tucked into the book from my dad - recipes he wants me to make for him. So I better get cracking!